The lake Balaton is a family paradise. Welcome to our guests. The lake is one of the most loved holiday places in Middle-Europe because of the weather, the good climatic and geography and because of its nice water temperature. Its area is almost 600km2. The lake is 77km long. Its mean width is 8km, the biggest difference between the two beaches is 14km. The lowest difference between Tihany and Szántód is 1.5km. The water is about 20-25 OC warm in the summer time. The south beach is very shallow, perfect for children and people who can not swim. It's a real paradise for big and small. The fans of water sports can find many possibilities for sail boating, windsurfing and rowing. The angler can practice their hobby too. You can find many places for riding. In the towns there are modern sport establishments like tennis courts and bowling opportunities. Not far from the lake are the famous termalbaths in Igal, Nagyatád, Csokonyavisonta and Csisztapuszta. 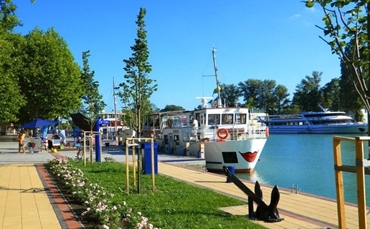 A lively holiday resort and an ideal centre for bathing, Siófok is a town with some 24,000 inhabitants in County Somogy and a centre of the southern shore of Lake Balaton, which is the biggest lake of Central and Eastern Europe. 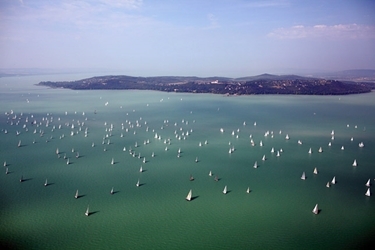 Being the largest holiday resort with 16 km long shore at the lake, it is often called the capital of Balaton. 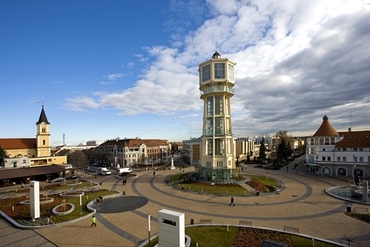 Today Siófok is a popular tourist and cultural centre, in 1997 it won a gold prize at the competition of the European Flower Cities. In ancient times the settlement was inhabited by the Celts and the Romans. In 292 Emperor Galerius had a lock built here at the Sió, a natural outflow of the lake, which connects the River Danube with Lake Balaton. The first written sources mentioned the place in 1137, though the Deed of Tihany, the first Hungarian linguistic record dating from 1055, included it as Fok. In Turkish times it used to be the most significant naval port of the enemy’s fleet, a water fortification was completely depopulated. The construction of the Southern Railway in 1861 was a turning point in the life of the place, then the modern Sió-lock and the port were completed. The bathing house was constructed in 1878, the water tower, a symbol of the town, in 1912. The single-towered Catholic church was built in Baroque style in 1739. Planned by Imre Makovecz, the Lutheran church was completed with Finnish help in 1993. The birthplace of Imre Kálmán, the world famous operetta composer who was born here, houses a museum today. The valuable collection of the Mineral Museum is also well worth a visit. The holiday resort is divided into three parts: the town centre, Golden Beach and Silver Beach. On the largest shoreline of the lake around 20,000 people can find recreation. The port is the centre of Balaton shipping. It is worth mentioning that the Balaton Meteorological Research Station can forecast storms bein developed suddenly.